If you have used a lawn fertilizing company in the past and were unhappy with the service and results, (or you got the feeling you were just another number on their corporate production quota)…please give us a call. 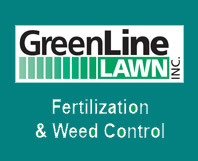 You will be amazed at the difference between GreenLine Lawn and all the other franchised lawn care companies. SPRING – A granular fertilizer is applied to the lawn along with a pre-emergent crabgrass control to prevent crabgrass and some annual weeds that may sprout. A broadleaf weed control will be applied if weather conditions permit. EARLY SUMMER – A slow release fertilizer is applied to take your lawn into the summer months. Broadleaf weed control will be applied as needed to keep your lawn weed free. FALL – Granular fertilizer is applied to strengthen and deepen the root system of your lawn. Proper fertilizing with balanced applications throughout the growing season promotes thick, dense grass that can resist disease and weed invasions. Applying too much of anyone of the basic elements can cause erratic results. For example, an over abundance of nitrogen will cause rapid growth of the grass plants that the roots can’t adequately handle; the blades become long and spindly. Balance is the key to a thicker greener lawn. Dry granular fertilizer with slow release nitrogen for proper root development is complimented by liquid weed control applications to maintain the texture and color of your lawn. Copyright © Green Line Lawn. All Rights Reserved.